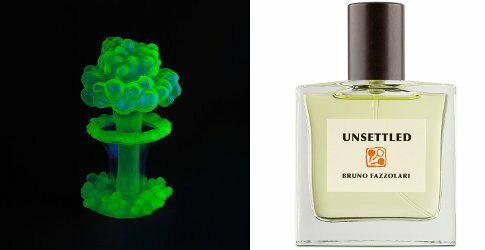 Indie perfumer Bruno Fazzolari has launched Unsettled, a new fragrance. Unsettled was commissioned for the exhibit of the same name at the Nevada Museum of Art, and is presented there in the uranium glass bottle shown above left. The fragrance takes its inspiration from the history of the sandalwood and tea trade in the South Pacific, as well as from a pineapple themed perfume called “Colony,” launched by the house of Jean Patou in 1938. [...] Unsettled is a fresh, creamy sandalwood scent with a delicious tea and pineapple accord that recalls a beach holiday. It includes an absolute of China black tea and sustainably harvested sandalwood from New Caledonia. Additional notes include bergamot, clary sage, labdanum, vanilla and ocean breezes. Bruno Fazzolari Unsettled is $38 for special edition 9 ml with chapbook, or $110 for 30 ml. Hmm, I think I would be decidedly unsettled if I had a uranium glass bottle of scent in my cabinet. That bottle isn’t for sale, so no worries! I’m really tempted by the 9ml size, but I’d love to see a couple reviews before I blind buy. The 9 ml looks cute. Intrigued by the nod to a classic Patou that I’ve never smelled, but wary of the ocean breezes.